Recently I participated in a Simply Asia recipe challenge where I had to create three dishes. My side dish recipe is this Asian Chicken Noodle Soup. Think comfort food with a kick! I loved the addition of fresh ginger and the extra layers of flavour it provided. This to me is more something I’d make in the fall or winter, but we all had summer colds (blech) and this soup really hit the spot! Plus, they say garlic is healing! I used Garlic Basil flavoured noodles, but you could really use any variety. Add in your favourite flavour. Maybe curry flavour for some heat? I might try and make this recipe in the crockpot and see how it compares to the stovetop method. I use my crockpot more in the winter though. It’s stored away in the summer months! If you wanted to check out my other recipe submissions, feel free. I made Ginger Meatballs as an appetizer and Spicy Shrimp & Vegetable Stir Fry as my entree. Which one is your favourite? 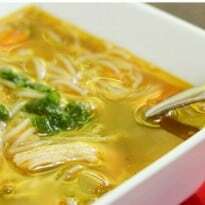 A kick of ginger gives it an exotic flair and makes this an awesome soup to eat when you are sick! Heat oil in a large pot over medium heat. Add in green onions, carrots, celery, ginger, garlic and Sweet Ginger Garlic Seasoning. Cook for 5 to 7 minutes, stirring occasionally. Add chicken broth and chicken. Then add the noodles along with the seasoning package and ½ tsp. of the sauce that comes with the noodles. Stir and bring to a boil. Reduce heat to minimum and cover. Simmer for an hour. Oh my goodness! This sounds so good! I will make it tomorrow since hot soup in -30C weather seems to jive! It looks delicious. I love your recipes.